2 x Vegetarian Empanadas, 1 x Paella Vegetarian (V, GF), 1 x 6 pack Original Churros with Dark Chocolate Dipping Sauce. Corn pastry with mince beef, onions and potato or vegetarian, with leek, zucchini and semi dried tomato. Chunky battered spicy chips served with jalapeno mayo. Lightly fried apple wedges dusted with cinnamon sugar served with whipped cream. Made using a trio of lettuce, tomato, beetroot, corn kernels, topped with feta cheese and drizzled with pomegranate dressing. Made using red lentils, quinoa, rice, carrots, celery, onions and spices. Served with toasted bread. Seasoned and crumbed chicken breast fillet with jalapeno mayo, pickles, lettuce, tomato served with patatas. Pan cooked tortilla filled with red and green capsicum, onion and shredded tasty and mozzarella cheese with your choice of pork chorizo, pulled chicken or mushroom. 150g Organic Bio-Dynamic 100% beef chorizo burger on a toasted burger bun layered with pesto lettuce, tomato, onions, slice of tasty cheese and a fried egg, served with patatas. Traditional Spanish rice dish made with mushrooms, zucchini currants, pine nuts, red and green capsicums, garlic, onions, and snow peas in a base of rice homemade stock. Traditional Spanish rice dish made with chunky chicken sliced chorizo, capsicums, garlic, onions and snow peas in a base of rice homemade stock. Traditional Spanish rice dish made with seafood prawns, mussels, calamari, scallops, fish, capsicums, garlic, onions and snow peas in a base of rice homemade stock. Fresh hot churros dusted with cinnamon and sugar. Original 3 Pieces has 1 dipping sauce. Original 6 Pieces has 3 dipping sauces. 18 Bite size original churros and 3 dipping sauces. 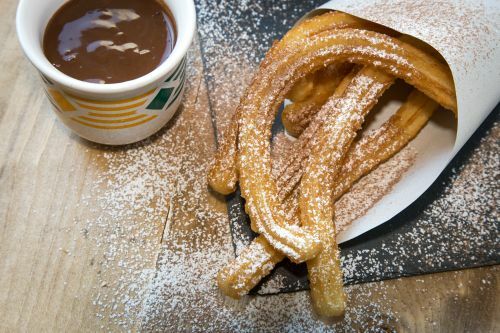 Fresh hot churro filled with your choice of filling: chocolate, caramel, custard, strawberry jam, Nutella and peanut butter. Various chocolate coated churros with toppings and sprinkles – coconut and strawberry jam, triple chocolate, white chocolate and dark chocolate. 9 x bite size churros and 1 milk chocolate dipping sauce. 15 x bite size churros, 1 dark chocolate and 1 milk chocolate dipping sauces. 21 x bite size churros, 1 dark chocolate, 1 white chocolate and 1 milk chocolate dipping sauces. 2 x large hot chocolates and 9 x mini traditional churros. Caramel milkshake with churros and whipped cream. Ice cream and San Pellegrino citrus soft drink. A family recipe with sparkling grape, blended lemon, orange and apple juice, cinnamon syrup and sliced fruit. Assorted real fruits citrus sodas.